Let me begin by saying two things. 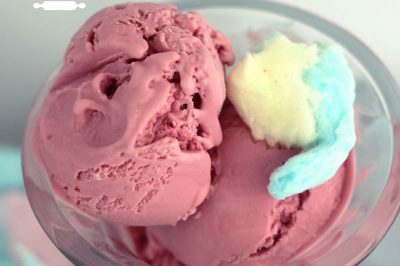 One, I want to apologize for the quality of the pictures in this post. One was taken nine years ago and the rest were taken in a dark hotel room, at night with a cell phone. Two, I AM NOT 40!! Okay, now that I have gotten that out, let me begin. We all have those friends who are constantly playing practical jokes on us. Actually, I should say, MY friends all have a friend who is constantly playing practical jokes on them, since that person would be me. Over the years my sick sense of humor has come back to haunt me now and again; the most recent being just a few days ago when I celebrated my 39th birthday. One of my best friends is Paula Ames. She also happens to be an incredible, award-winning cake decorator. Paula is older than me (by only a few months, but still older) so I like to rub that in whenever possible. Nine years ago, she was feeling devastated by the fact that she was turning 30. Her husband and I got together and came up with a brilliant idea. 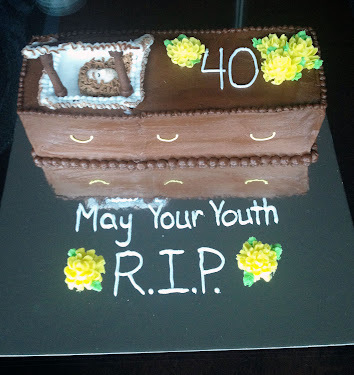 Being the loving, supportive people that we are, we decided it would be funny if I made her a coffin cake with her body inside of it for her 30th birthday. Here it is, the chocolate buttercream coffin cake I made for Paula, nine years ago. As might be expected, she didn’t really think it was quite as funny as we did. 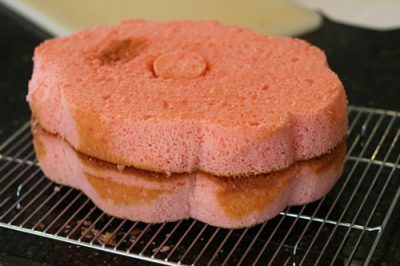 The interesting thing is that at that time, Paula had not started decorating cakes yet. It wasn’t long after that cake, though, that she began to learn and eventually developed a highly successful cake business. 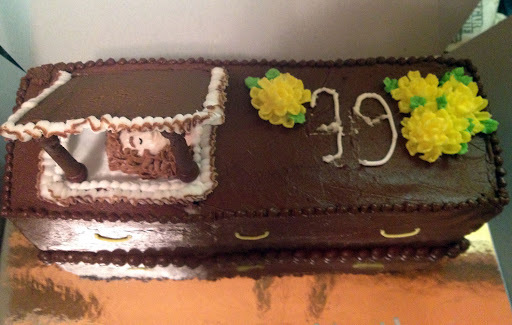 I believe that coffin cake is what changed the destiny of her life. Fast forward nine years. This is the year of our 39th birthdays. We are both on the top of that proverbial “hill” and realizing that we will soon be falling down it, face first. So, as her birthday rolled around last March I made her another confectionery reminder of the loss of her youth. Click here to see the post on the Old Lady cookies I sent her for her birthday. Paula threatened that there would be payback but I was feeling pretty safe because I was going to be in Las Vegas during my birthday. What I didn’t account for was the fact that we have a mutual friend, Ameila Carbine, whom lives in Las Vegas. 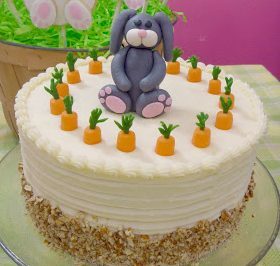 Amelia is also an incredible, award-winning decorator as well as the moderator of the CakeFu Master Webinar Series. Unbeknownst to me, Paula and Amelia plotted together to get me back. Paula gave Amelia a picture of the coffin cake I made her years ago and asked Amelia to replicate it exactly, except for changing the number from “30” to “40”. (Again, I reiterate, I am 39, not 40!) then have it delivered to my hotel in Vegas. 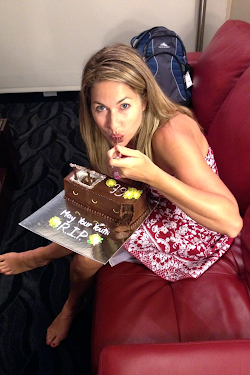 I walked into my hotel room on the night of my birthday and this is what I found sitting on the counter in my room. It was major deja vu! There I am in my final state of rest. All I could do was laugh until it hurt. Not only was it funny because of how sneaky they were and how identical the cake was, but Amelia is an extremely high level cake decorator. 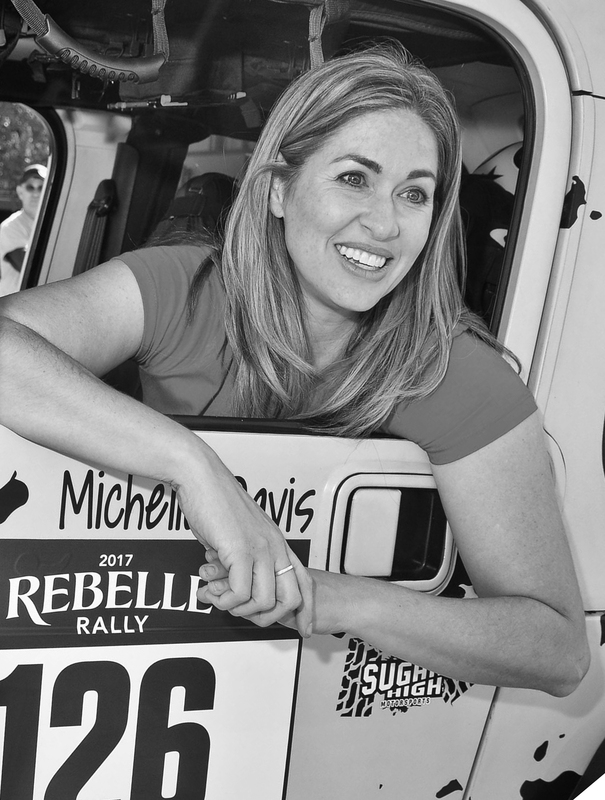 She has won prestigious awards, been published in magazines and appeared on TLC’s Ultimate Cake Off. 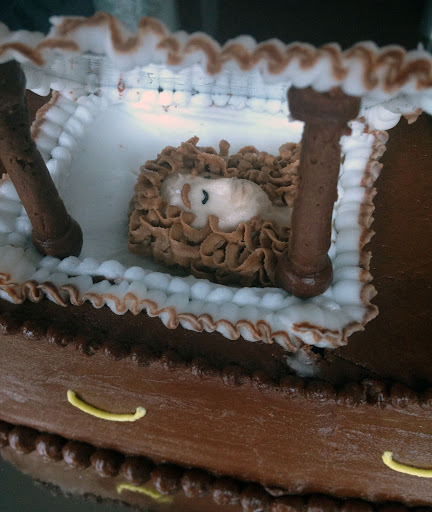 This isn’t the level of cake you expect to see from someone that talented. I was honored that she would be humble enough to make such a cake all for the sake of a practical joke. 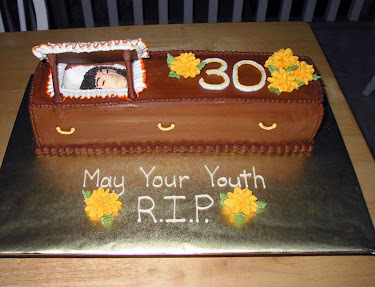 The first thing I had to do, though, was take a knife and scrape the icing around to put the correct age on the cake. Practical joke or not, I refuse to be 40 until next year. Then the next thing I did was take a bite. It may have looked morbid but man did it taste good! I think Amelia owes me her chocolate cake recipe as repentance for such an insulting birthday gift. My 39th birthday will definitely be one I will never forget. As for my friends, it is like the old saying, “With friends like these, who needs enemies?” I can only imagine what next year is going to be like since Paula and I will both be turning 40. I better get started on Paula’s gift now. RUDE!!! My birthday is in MARCH!!! Haha! I knew that. I can’t believe I put May. I will change it. I guess I was just thinking that since you are so young looking that you had to be at least a couple months younger than what you really are. Haha!